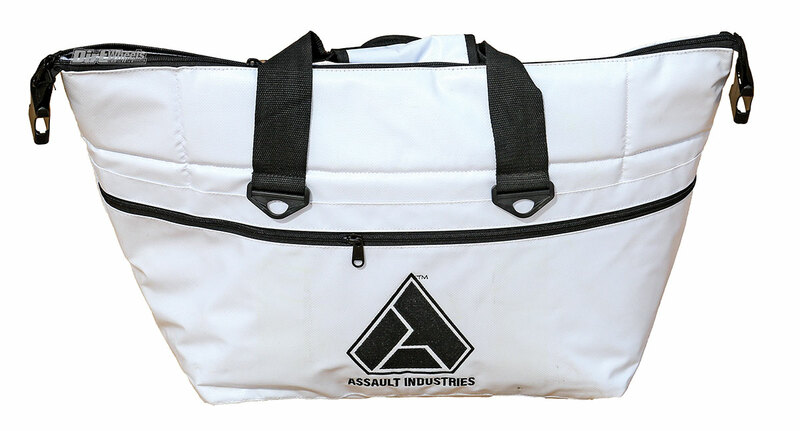 Our cooler bag from Assault Industries proved a boon on a recent dune trip. We figured the white would bite the dust, but it still looks new. We are accustomed to going to Assault Industries when we want hard parts—stuff whittled and welded from steel, aluminum and even shaped from glass. But, the popular aftermarket builder has soft items as well. One is the handy and effective off-road cooler bag. It comes in white or black. At first we groaned when we saw the white color, but went ahead and tossed it in the back seat of a RZR XP 4 Turbo S for days in the dunes. We loaded the bag with bottles of water and cans of energy drink. We don’t know what your experience is with cooler bags, but for us, canned drinks in a cooler mixed with pounding whoops and rocks in a UTV is a guarantee of ruined cans, but that didn’t happen. This cooler bag is truly a do-it-all. You unzip the top, toss in your stuff and stuff it in the car. We let it wedge between the front and back seats, and we didn’t even bother securing it since our Turbo S has full doors. After two solid days of unsecured pounding, we were shocked by a few things. First, the white finish was still spotless with no wear or rub marks. Second, the fragile aluminum drink cans came out in perfect condition. We soon found that we were storing other items we wanted handy in the cooler bag. We were driving in 95-degree heat, and we put no ice in the bag, but everything stayed cool. 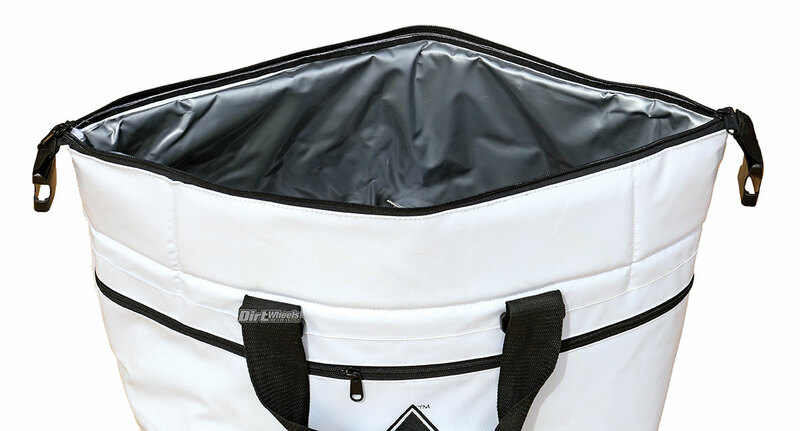 The inside of the cooler bag is a robust silver material that we expect to last a good, long time. There is a removable shoulder strap to help carry it. If you do want to secure the $59.99 bag, it has four handy tie-down points. If all of your adventures are not motorized, the bag comes with a clip-on shoulder strap. There is also a front pocket suitable for flat items like paper plates or napkins. We have other fancy coolers that are semi-rigid and some expensive ones that are rigid. We can see us using the Assault bag cooler the most often while driving off-road. The natural tendency of the padded soft bag to close up allows it to grasp whatever is carried in the bag, so the contents stay in good condition. Find out more on Assault Industries here: www.assaultind.com or (714) 799-6711.